Which Richard White was Buried in Levant Mine? It has sometimes been assumed that this unfortunate miner must be the same Richard White who was the mine's long-serving purser but this seems unlikely. Richard White, the purser, was the son of Nathan and Kezia White of Tregeseal and was baptised in St Just Parish Church on 21 August 1831. The 1841 census shows him to be 10 years old and living with his family in Trewellard. In June 1840 he'd have been only nine years old and as the son of a reasonably prosperous farmer it's most unlikely that he would have been sent underground at such a young age. He was presumably still at school. In 1851 the census shows young Richard, now 19 years old, still at home with his parents in Trewellard but he is now employed as a Mine Clerk, the only one of the four brothers to have a trade. The others are probably running the farm, their father now being 68 years old. 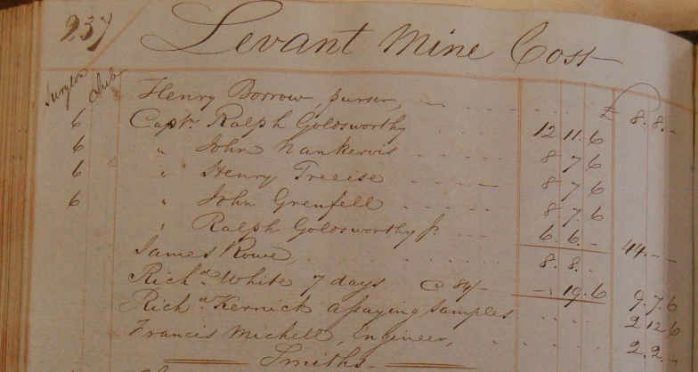 The 1851 census was taken on 30 March 1851 and Richard White first appears in the Levant Cost Books in June 1850 when he is listed with the managers and count house staff as having done seven days work at £4-4-0 per month which earned him 19s 6d. This is presumably his first pay packet and he must have started work on or around 24 June 1850. The following month he earns a full pay packet of £4-4-0. Richard White of Boscaswell aged 30, a miner and father of four sons and a daughter. One of the sons is also called Richard and is 13 years old. Richard White of Carnyorth aged 18, a miner and son of William and Mary White. Richard White of Trevean aged 14, a miner, son of William and Elizabeth White. Father and three brothers are miners. So we have five possibilities though the youngest is not described as a miner while all the others are. It isn't really possible to pin down where these four men and a boy worked. The earliest complete period in the Levant Cost Books is October-November 1843 but no Richard White is listed. This is no great surprise, the Cost Book doesn't list everyone, the underground miners work in pares (small groups) and the Cost Book lists them as, for instance, Thomas White & Co. or William White & Co. The “& Co.” could be hiding anywhere from one to three or four names though at this point in Levant it is most commonly two. Without more information it's impossible to identify who the Richard White buried in 1840 was but it seems pretty safe to say that it was not Richard White the son of Nathan and Kezia who became purser of Levant. The story that Richard White, the purser, was buried in 1840 was brought forward to demonstrate that it was not true that he had never been underground despite his many years of service at the mine. At this remove it's impossible to say whether Purser Richard White ever went underground, though it seems unlikely that he didn't, but the story of the 1840 burial cannot be used to prove that he did. Richard White was a bit of a toff, a bit of a swell, a smart kind of a chap and it probably suited his image (and photographs certainly show an image conscious man) to have the reputation of the man who saved and ran Levant without ever getting dirty or going underground. The story that Levant Purser Richard White was buried as a boy has been often repeated and can be found in print in Levant: A Champion Cornish Mine, John Corin, new extended edition of 2007. The most recent editions of the book no longer contain the story.